The opening of the Constitutional Court on the 21st March 2004 in Johannesburg was an eventful national day, because, built on the site of the notorious Number 4 prison, the Court symbolized the intention to build a just future out of the memory of oppression. The incorporation of existing prison buildings and materials in the new court building reinforced the discourse of rebuilding and reconciliation that was to characterise the new nation state. As a text the building yields a broader and paradoxical meaning, for the utopian vision of a just future rests in a building in the service of state ideology. This is a paradox because ideology and utopia are regarded as opposites-ideology legitimates the present while utopia critiques it with a vision of a transformed future. However the building demonstrates a feature of ideology that Marxist philosopher Ernst Bloch first revealed: that all ideology has a utopian element because without it, no "spiritual surplus, no idea of a better world would be possible." This essay reads the building to show both the function of memory in visions of the future, and the function of utopia in ideology, while using Bloch's theory to interpret the utopian function of the building. Keywords: Constitution Hill (South Africa), memory, ideology and utopia. 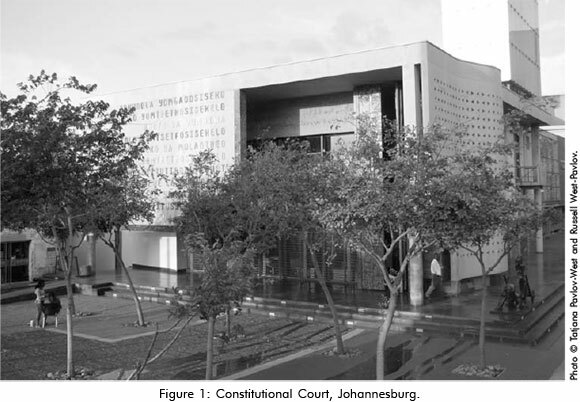 The strategy of incorporating existing prison buildings with the new Court building reinforced the discourse of rebuilding and reconciliation, fundamental tenets of the founding myth of post-apartheid South Africa. In broader terms it coincides with the utopian program of postcolonial African societies generated powerfully, though not solely, through their literatures. But in this case the utopian vision of reconciliation and hope is focused in a building, a building that exists in the service of a state ideology. This is a paradox-ideology legitimates the present while utopia critiques it with a vision of a transformed future. But the union of these two apparently opposed narratives is in fact a demonstration of a feature of ideology that philosophers Ernst Bloch, Karl Mannheim and Paul Ricoeur revealed: that contrary to classic Marxist doctrine, all ideologies have a utopian element, without which they have no power of legitimation. The question is: to what extent can utopia disrupt legitimating power of the ideology that employs it? A good definition of utopia is offered by Ruth Levitas-the "desire for a better way of living expressed in the description of a different kind of society that makes possible that alternative way of life" (Levitas 257). This concept of an 'alternative' reveals the disruptive potential of utopian thinking that sits uneasily with state ideology, however progressive. In ideology and utopia we find an "interplay of the two fundamental directions of the social imagination" (Ricoeur, "Ideology and Utopia as Cultural Imagination" 27). But the critical feature of the approach to these apparently very different directions by Mannheim, Ricoeur and Bloch is that there is interplay. Contrary to Marxist ideology critique they all find a positive element in the legitimating function of ideology that is borne out of a utopian dimension. The decision to build the court on Constitution Hill, and the architecture of the building itself, are resounding demonstrations of hope for a democratic and constitutionally equitable future. But it is also an ideological building, a state institution. So, how easily does a utopian critique of the present sit with national ideology? This reading of the Constitution Court aims to demonstrate Ernst Bloch's general contention that all ideology has a utopian element; while revealing that the Court itself is a focus of the utopian dimension of South African state ideology. The concept of national ideology is extremely problematic in postcolonial studies. The utopian vision of an independent nation is often dashed after a comprador elite takes over, occupying the boundaries of the colonial state and continuing the trajectory of colonial administration. This has led to a robust questioning of the nation state in postcolonial theory, and much of the utopianism of postcolonial thinkers has extended beyond the state and beyond the nation, because, as Ricoeur points out, "all utopias finally come to grips with the problem of authority" (Ricoeur, Lectures 298). But the advent of the post-colonial nation raises the question of the place of national ideology itself. For all its apparent failures, does the comparatively progressive nature of the national ideology of former colonies require us to see the link between ideology and postcolonial utopia as more nuanced? When state ideology seems to have simply betrayed the pre-independence utopianism of decolonizing countries, does the hope for the future still remain? Ricoeur points out that ideology has a significant constitutive function both in legitimation and identification, and that it reflects utopia in certain ways: both can be seen positively and negatively; both have a pathological and constitutive dimension, the pathological always appearing first (Ricoeur, Lectures 1). But crucially, Ricoeur's position might best be explained by the fact that 'reality' itself is framed by ideology (Ricoeur, Lectures 171) and that it is impossible for the critic to escape it. This is generally known as 'Mannheim's paradox'. Mannheim confessed that he was unable to critique ideology from any position outside ideology itself. Ricoeur responded that it was precisely the 'nowhere' of utopia from which ideology could be critiqued (Ricoeur, Lectures 17). Karl Mannheim's Ideology and Utopia (1936) was the first work to focus directly on the relationship, but it is Mannheim's take on ideology rather than utopia that exercises most critics. Paul Ricoeur's lectures on Ideology and Utopia in 1976 presented one of the most comprehensive discussions of the link between these two apparent opposites (Ricoeur, Lectures). Ernst Bloch's discussion of the utopian dimension of ideology is generally overlooked so it is appropriate to begin with him. In The Principle of Hope Bloch conforms more readily (than his early Spirit of Utopia) to Marx's dictum that "Ideologies as the ruling ideas of an age, are [...] the ideas of the ruling class" (Bloch, The Principle of Hope 150). But he insisted that ideologies also incorporate the image of a world beyond alienation and that without the utopian function operating even within ideology, no spiritual surplus, no idea of a better world would be possible. Certainly, he concurs, "since ideologies are always originally those of the ruling class, they justify existing social conditions by denying their economic roots and disguising exploitation" (Bloch, The Principle of Hope 149). But in ideology there is an attempt to transcend the present "through its embellishing, condensing, perfecting or signifying exaggeration" (Bloch, The Principle of Hope 149), and for Bloch this is not possible without a distorted or displaced utopian function. Importantly, although distorted, "the original and sustained concrete utopian function must also be discoverable in these inauthentic improvements" (Bloch, The Principle of Hope 149). Bloch's purpose is at least threefold: on the one hand he is convinced that utopian hope is so fundamental to human life that it characterizes every aspect of social thinking, that the need to grasp the spirit (Geist) of Utopia in human consciousness was fundamental to understanding human life; on another he wants to make a case for progressive socialist ideology, "the ideology of the revolutionary proletariat" (Bloch, The Principle of Hope 155), as something more than mystification. But he also contends that all ideological discourses contain appeals to a better life. They contain a 'surplus' or 'excess' that is not limited to mystification. The point is that while the utopian surplus exists within ideology, it creates tension between the vision and the reality that can expose levels of social inequality while maintaining the hope for justice. This tension raises the question of the emancipatory potential of a post-colonial state ideology. Bloch's position was not simply that there was 'bad' ideology and 'good' (i.e. socialist) ideology but that all ideology has a utopian element that needed to be understood. Rather than simply denounce ideology Bloch wants to examine ideology for any emancipatory potential. Hence, rather than claim that postcolonial state ideology is progressive (which it is not necessarily) and therefore good, we need to examine ways in which the utopian element of ideology may be maintained as a form of self critique. Inevitably, for Bloch, the great statements of culture incorporate a spiritual surplus and in Constitution Hill we find a cultural production that Bloch might have called a "great statement." This may seem to be far too exalted a company for the Constitutional Court, but the point is that the spirit of utopia embodied in architecture rises beyond political motivation, no matter how much the object (a law court) appears to operate in the service of the state. Such "great statements" are ultimately statements of the Not-Yet-Conscious. The way in which the utopian dimension of ideology may retain its critical capacity is its emphasis on the Not-Yet. On Constitution Hill the physical constitution of memory on which visions of a future-visions that support both the ideology of the state and the hopes of the people-emerges in the architecture of the Court building. The Constitutional Court, which can be regarded as an example of a symbolic discourse, hinges on an interplay of memory, ideology and utopia that objectifies the paradox of the postcolonial state: if utopia is a critique of the present how can it support the promise of legitimacy that underlies state ideology? Or is the emancipatory vision of a newly independent and de-legitimised apartheid state justified in deploying a utopian anticipation of the future in its service? These questions are set in stone, so to speak, in the architecture of the Constitutional Court in which the decorative program of a state building demonstrates a utopianism that may or may not escape the legitimating ideology that produces it. The broader question is: do we need a different form of critique for the interplay of ideology and utopia in postcolonial states, one that transcends the traditional class-based direction of Marxist ideology critique? For Karl Mannheim both ideology and utopia are distortions of the 'real' that differ in their mode of distortion, in that ideologies are antiquated modes of belief, products of an earlier, surpassed reality, whilst utopias are in advance of the current reality; "ideologies are therefore transcendent by virtue of their orientation to the past, whilst utopias are transcendent by virtue of their orientation to the future" (Geoghaegan 124). But the orientation to the past, and indeed a defining factor in postcolonial utopianism, is dominated by the ubiquitous and powerful presence of memory, what Idouard Glissant calls a "prophetic vision of the past" (Glissant 64). Here it is memory of a particular kind-that of the violence of apartheid on one hand and of an African cultural heritage on the other. But it is also memory on which the future is built and in this case that memory is concretized in two structures: the preserved buildings of the Number 4 prison and the Constitutional Court itself. So if we read the building as an allegory of the fusion of postcolonial ideology and utopia we see that the "transcendence" of each is not as clearly contrasted as Mannheim's view of ideology. Memory forms the link between ideology and utopia in the postcolonial state and in a curious way memory enables a more open dialogue around the contradictions raised between the utopian vision of justice and the reality of continuing inequality. This is in effect a dialogue between the legitimating function of state ideology and the insurgent function of utopia. Since the postcolonial 'text' we are reading here is a building it is fitting that memory can be seen to be expressed in several features of its construction: its location, materials, design, community crafters, artworks and the visitors' program put in place on its completion. These are designed to link a vision of the future with social memory, a memory of oppression set within the memory of the deep cultural past. This link, formed in what can be termed symbolic memory, operates in several fields. The concept of symbolic memory is important for what we might call the 'recollection of the future' because it provides a collective foundation on which the future can be realized. Symbolic memory is particularly important in the ideology of the nation-state, and usually represented by monuments and memorials, but the Constitutional Court shows how it may be a basis for a vision of the future. Constitution Hill is located in the postcolonial city of Johannesburg, and such cities inevitably become sites of a contest between the state and the diversity of the "transnation" (Ashcroft) the exorbitant proliferation of subject positions that flows in, around, and between the structures of the state. As a national edifice the Constitutional Court is designed to resolve this conflict, but the conflict remains as a strong trace of the city's colonial origins. Colonial cities focus the diasporic movement of populations, becoming microcosms of the global flow of peoples that intensifies during and after the period of European imperialism. Similarly Johannesburg, as the economic giant of Africa, drew migrants from all over the continent. Postcolonial cities have always had a fractious relationship with national mythology, which invariably locates itself in the non-urban heartland. This is greatly magnified of course when a white state apparatus controls a black nation. Most colonial cities are established by the colonial administration, freshly minted to further its economic agenda, and in the case of Johannesburg, it arose as a gold boomtown, having no other reason to exist than the discovery of gold in the 1880s. This character of gold boomtown meant that Johannesburg maintained a diverse, intermixed urban population as its economic centrality drew migrants from all over Africa. The official response to this was panoptic: a prison built in 1892 by Paul Kruger's Zuid-Afrikaansche Republiek (ZAR) was extended in 1899 by the addition of ramparts to become a fort. The fort served as a bastion against British incursion during the South African War (1899-1902) but it never played a crucial military role. Its more endemic function was to act as a vantage point from which Kruger's forces could survey the foreign miners (uitlanders) in the mining camp that was Johannesburg below, and who, Kruger believed, were plotting to overthrow him (Gevisser 509).2 When the jails closed in 1983, the site lay abandoned for many years, until in 1996, the judges of the newly established Constitutional Court announced that this was to become the home of the Court. 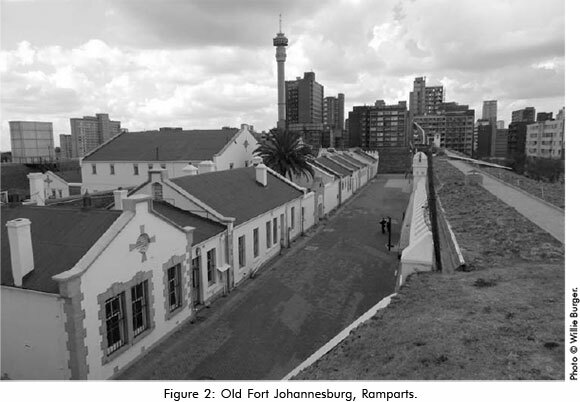 Constitution Hill is a strategic site because its position on a ridge occupies the topographical sign of continuing class and race divisions of Johannesburg society: (see figure 2). Because Johannesburg came to postcolonial status in what may be regarded as a post-national world the question of belonging assumes a particular complexity. The post-independence euphoria of African countries in the 1960s, euphoria soon replaced by disillusionment, has not been quite the same experience of post-apartheid South Africa, perhaps because, coming much later, the expectations of the population have been more cautious (or more cynical), and ironically, its civic institutions more stable. Consequently the ANC government appears to have avoided the route taken by other decolonized nations of erecting signature public buildings as symbols of the state. The Constitutional Court represents a radical way of rethinking the role of public buildings in imagining a South African identity grounded on notions of unity in diversity. 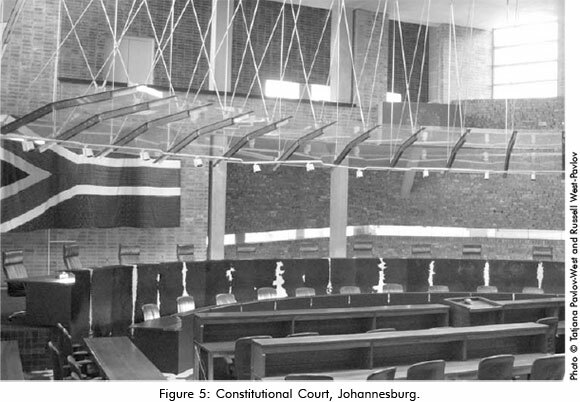 If, as many believe, the ideology of South Africa as a postcolonial nation has focused less on nationalism and independence and more on identity, culture and community, (a profoundly utopian notion itself) then this is reflected in the both the discourse surrounding Constitution Hill and the decorative program of the Court's architecture. While the function of utopia is to critique the present with a vision of the future the ideological requirements of the state render the dialogue between ideology and utopia peculiarly ambivalent. But this is why memory is so important to form a bridge between past and future, between reality and possibility, because while the future signifies the Not-Yet, memory offers at least the possibility of refusing to gloss over the inequalities that carry over from past to present. 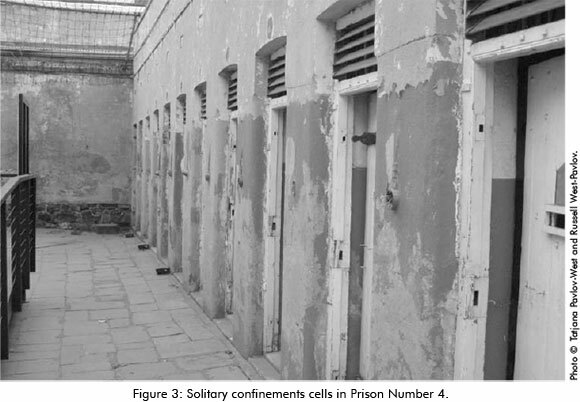 The first signifiers of a non-discursive memory are the materials used to build (or decorate) the court and the material function of memory begins in the gaol, where the materialization of memory can be found in the physical presence of the cells and exercise yards of Number 4 (see figure 3). The gaol was called that "because the black male section was 'section four,' and those two words still send shivers down people's spines" (Gevisser 508). Although not everybody had been locked up here, everybody in Johannesburg has lived with Number 4 on their minds. After all, anything could constitute a pass violation. Nolundi Notamo, a pass offender recalls: "My grandmother had taught us to say goodbye when we went to shop in town, because we never knew if we would come back or not. We used to say, 'If you don't see me, check for me at Number Four'" (Madikida et al. 18). Moving through the prison there are stories and small museums dedicated to those like Mahatma Gandhi who refused to pay a fine in order to show solidarity with the victims of the regime. Although not a political prison, the line between political prisoners and criminals was difficult to draw given the nature of the justice system under apartheid. But many of the major resistance figures against apartheid-Nelson and Winnie Mandela, Fatima Meer-spent time in Number 4. The stories tell a grim history. But memory is contained in something more than the official history, something more than the stories of inmates, even something more than the blankets rolled to make couches for the cell boss, or replicas of tanks or trucks for a prison competition. It is memory any visitor can sense-a memory in the very bricks and stones themselves. This memory dwells there beyond narrative, beyond interpretation, even beyond the graffiti that inscribes the prisoners' existence on its walls. Memory in Number 4 is a presence that offers a kind of 'knowing' beyond the narrative of history. The visitor feels that if the historical narrative were suppressed the memory would remain in the ugly reality of the cells. "You really do feel when you walk into it that you're entering the dark heart of apartheid, that you're treading on bones" (Gevisser 513). This, perhaps, is the way memory materializes, the way the experience of memory may be shared. But with the stories of the treatment of prisoners comes bafflement. Why so much humiliation? Unfair and unjustified incarceration is one thing. But why the gratuitous humiliation of the tauza dance, which prisoners were forced to perform to show that they were not hiding anything in their anuses? Why the sadistic humiliation of meal times where prisoners sat in lines on a sloping exercise yard that looked up into exposed toilets? Why allow the showers to be controlled by the prison's dominant gangs? Clearly the answer lies in apartheid itself. It exists not simply for control but for humiliation, for de-humanizing, and ultimately it de-humanizes both perpetrator and victim, both white and black. Something of this remains in the cells- so manifestly were the buildings of Number 4 constructed for their carceral function, so resolutely do they hold the memory of apartheid that they resist re-use for any other purpose. Such a past offers a ready trap for resentment, but it can also be the basis for a vision of the future. In the words of African-American formulator of pan-Africanism, Alexander Crummel, "What I would fain have you guard against is not the memory of slavery, but the constant recollection of it, as the commanding thought of a new people, who should be marching on to the broadest freedom in a new and glorious present, and a still more magnificent future." (Crummel 13) There is a great difference between the constant recollection of apartheid and the memory of it, and this difference is captured by the phenomenon of symbolic memory, seen in a Johannesburg building in which memory reaches beyond apartheid. Whether Constitution Hill builds a monument to the past or establishes a memorial looking to the future may depend on how the memory of Mandela comes to be positioned in the ideology of the state. There is much about Mandela that was conveniently forgotten: he criticized the Iraq war and American imperialism; he called freedom from poverty a "fundamental human right"; he criticized the "War on Terror" and the labeling of individuals as terrorists, even Osama bin Laden, without due process; he criticized racism in the US; he refused to abandon Castro or Gaddafi who supported the ANC's war against apartheid; he supported labour unions passionately (Shen and Legum). His deification to an international saint has been at the expense of suppressing much of his international activism but he remains important to the memory of apartheid because he embodies the fact that change is possible. Ultimately, some part of the hope that Mandela symbolizes is captured in the structure of the Constitutional Court. This decorative program involves several features, including the use of materials, interior design, community-workshop crafters and commissioned artwork, all of which are driven by the need "to establish a visual rhetoric of 'community united in diversity'" (Freschi 30). The decorative program suggests an observation of Bloch's on the importance of cultural production to utopia. For him "Utopian function tears the concerns of human culture away from [...] an idle bed of mere contemplation" (Bloch, The Principle of Hope 158). What may appear 'mere' decoration, becomes, when it extends beyond the period of the dominant ideology, an embodiment of hope. But such hope is invested, as it is in all postcolonial utopianism, in memory. To invoke this memory the materials used in the building are particularly significant. Just as the memory of apartheid materializes in the stones and bricks of Number 4 so the materials used in the court are directly symbolic of social and cultural memory. 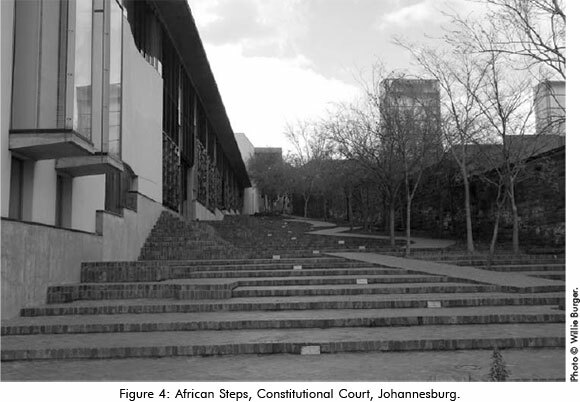 For example the most symbolic element of the court are the Great African Steps, a walkway built with red bricks salvaged from the Awaiting-Trial Prison, which was demolished to make way for the court, and which divides the court from the old Women's Gaol (see figure 4). This belief is most obviously expressed in Constitutional Court by the Great African Steps, which, in effect, are not particularly great, either in scale, or in their denial of wheelchair access. Essentially an invention of a (re)-imagined past, these steps are a clear and, seen against the potency of the site and its associations, completely unnecessary example of an "official nationalist" imagining of identity and authenticity (Freschi 44). Whether the "African Steps" are "unnecessary" as Freschi claims, they augment the very necessary ideological function of declaring the ancient heritage of the new nation. All nations invent an ancient past, but the fact that these are steps which extend up the hill between the adjacent Number 4 Gaol and Constitutional Court complex- leading up from the level of the solitary confinement cells to the court entrance- symbolizes a process by which the future is both connected to and shaped by the past. The ambivalence of this employment of an archaic African heritage is the ambivalence of the utopian dimension of ideology, but the concept of process in the structure keeps the future trajectory of memory firmly in view. In effect, the future is remembered, not by the recollection of apartheid, but by the memory of an African heritage- Glissant's "prophetic vision of the past" (Glissant 64). The references to the African past, rather than anything specific to the city are also implied in a stylized tree, which, conflated with the South African flag, informs the design of the court's logo and which serves as a structural metaphor in the foyer. The notion of a tree as a metaphor of place and community reflects a somewhat generalized interpretation of the Southern African tradition of dispensing justice from beneath a tree-what the Constitutional Court of South Africa website recalls as "the trees under which African villagers traditionally resolved their legal disputes" (Freschi 42). However, the metaphor has been somewhat adapted to the purpose of the court, because traditionally only the adult men of a community were invited to participate (Freschi 42). The brick wall is a material sign of the place of memory in the rebuilding of the future. It serves to remind the visitor that the court is "a place where you find yourself between the past and the future, and where you understand that the only way the future can happen, resting on the past, is through your agency as someone in the present" (Gevisser 511). Just like the stones and architectural features of Number 4, the bricks are an open signifier, easily captured by the state ideology of bridging the past and future, but not limited to it. Their roughness alone is a sign of a memory that cannot be fully articulated. Thus the brick wall, like Number 4 offers the presence of a memory that cannot be entirely captured by language. The visitor program continues a number of symbolic features incorporated into the building by emphasizing such processes as ways in which the future can be achieved. The function of memory in Constitution Hill may be viewed in the context of other museums and memorials, such as the District Six museum in Cape Town, Freedom Park in Pretoria and the Hector Pieterson Museum in Soweto, which work either tangentially or in opposition to the Court building. The Hector Pieterson Museum, exhibits photographs of and around the march on 16 June 1976 by students protesting at being forced to be taught through the medium of Afrikaans, a language they associated with oppression. The Pieterson museum is a testament to the power of visual memory. Dedicated to Hector Pieterson, who was one of the first killed by police, it arguably owes its existence to the fact that photographer Samuel Nzima, happened to be standing by as Hector was deliberately shot down. The photo of his anguished sister, Antoinette Sithole, and 18-year old schoolboy, Mbuyisa Makhubu, carrying the dead boy in his arms flashed around the world. Some images seem to encapsulate an entire conflict, even an entire state philosophy. The photographs, which give immediacy and power to the memory of what is in effect a single day, appear to function as an active memory but they have a powerful symbolic function vested in the youth of the victims, the brutality of the police and the cause of the protest-the Afrikaans language. Here again the future is embedded in the symbolic memory of an ancient African past now measured in billions of years. The extent of this time span seems to promise a future that encompasses far more than nostalgia, far more than a recovery from the trauma of apartheid. It is a memory in which the Voortrekker Monument appears to stand for one fleeting episode. Questioning the centrality of the law suggests a utopianism that actively resists the ideology of the state. Ricoeur suggests that utopia becomes important because the use of power exposes a credibility gap in all systems of legitimation, all authority. Utopia exposes the credibility gap wherein all systems of authority exceed both our confidence in them and our belief in their legitimacy. Central to his theory is the function of power and how the problem of power is subverted by utopia. The Ladder of Freedom is not teleological precisely because it ends nowhere, the only place from which the ideology of the state can be critiqued. The conclusion to be drawn from this is that the Constitutional Court stimulates two kinds of imagination. While ideology appears to co-opt utopia to its program of integration, distortion and legitimation, it also works to open up the future because utopia is the nowhere from which the state, with its narrative of struggle and triumph, can be critiqued. It is the space that ideology can never control. What is at stake here is power and it is here that ideology and utopia intersect. For if ideology is the surplus value added to the lack of belief in authority, as Ricoeur contends, utopia is what unmasks this surplus value (Ricoeur, Lectures 298). Despite the operation of utopia within ideology all utopias finally come to grips with the problem of authority. In the end there is no special dispensation for postcolonial state ideology, socialist or otherwise, nor do ideology and utopia resolve themselves into a simple binary of good and bad. Rather the utopian element, what Bloch calls the Not-Yet, is present within the ideological structure of the Constitutional Court in a way that disrupts the legitimating function of ideology. This is because, as both art and architecture the Court building carries a spiritual surplus that escapes the confines of state ideology and it is within this surplus that the utopian intention to change the future, the belief in a better world, operates in the free space at the end of the Ladder of Freedom-the space of nowhere. Freedom Park. n.d. Dec. 2013. <http://www.freedompark.co.za> [ Links ]. Garson, Philippa. "Constitutional Court: A "Shining Beacon of Hope"". 23 Mar 2004. Nov 2013. <http://www.joburg.org.za/index.php?option=com_ content&view=article&id=1195:constitutional-court-a-sMning-beacon-of-hope&catid=122:heritage&Itemid=203> [ Links ]. Schlesinger, Larry. "What Nelson Mandela gave me: Hope for the Future of South Africa", Crikey Daily Mail. Dec 6 2013. n.d. <http://media.crikey.com.au/dm/newsletter/dailymail_ 567288fbf03ded65634fd5dbf9019273.html#article_27773> [ Links ]. Shen, Aviva and Judd Legum. "Six Things Nelson Mandela Believed that Most People Won't Talk About", Think Progress. 6 Dec 2013. n.d. <http://thinkprogress.org/home/2013/12/06/3030781/nelson-mandela-believed-people-wont-talk/> [ Links ]. 1. In private correspondence Bloch was scathing about Mannheim's unaccredited deployment of Bloch's views on the link between Ideology and Utopia. 2. Its most striking and perhaps symbolic features are the ramparts camouflaged as a hill, while the facade, with its ZAR coat of arms, was built on the inside. As Mark Gevisser notes this is a compelling image of the Dutch colonists' laager mentality, and in retrospect a metaphor of the inwardness and shortsightedness of their heirs, the Afrikaner nationalists. (Gevisser 510).